What: All remaining 2018 Models must be sold! No reasonable offer will be refused. Endless Pools from $12,995. Spas from $3,495. Get 36 months no interest financing O.A.C. All remaining Endless Pools floor Models 30% off. Save up to 60% on Patio Furniture, Hot Tubs from $3,495. Come see San Diegos's largest display of hot tubs and swim spas. DON'T MISS IT! When: Shop both stores 10a–6p Call (760) 846-1856 for details. 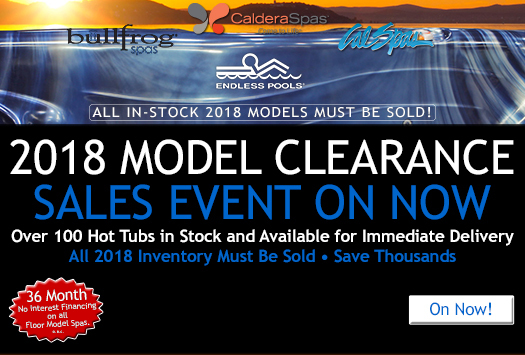 Caldera Spa Store San Diego, we are the factory authorized Caldera Hot Tub Dealer for San Diego, stop in too see the largest selection of Spas and Hot Tubs in San Diego. Cal Spa Hot Tub Store San Diego. We are the factory authorized San Diego Cal Spa Dealer. With over 50 Hot Tubs on display were sure to have the right spa for you. Endless Pools Swim Spa Factory Authorized Dealer San Diego. We're excited to announce that we Have all the New Endless Pool Swim Spas on Display and ready for test swims. Patio Furniture Store San Diego, we offer a large selection of Outdoor Patio Furniture, Patio Dining sets, Patio Bar Stools, and Patio Deep Seating sets. Swim Spa Dealer San Diego, we offer the largest selection of Swim Spas in San Diego, we even have Swim Spas filled with water, so bring your suit and try one out. BBQ Store San Diego, we offer a large selection of Built In BBQ Grills, Hardware, Outdoor Kitchens, Doors and Drawers, San Diego BBQ Showroom or Shop Online. Used Hot Tub San Diego. We specialize in refurbished spas. We carry pre-owned Hot Spring Spas, Jacuzzi Spas, Sundance Spas, Caldera Spas and Cal Spas. Caldera Spa Parts San Diego. We stock virtually every Caldera Hot Tub Part available. We are the factory authorized Caldera Spa Dealer for San Diego County. We just received 21 Factory Refurbished Spas. Get the hot tub of your dreams without breaking the bank. Don't wait these always go quick when we get them. We are a family owned and operated business where both our San Diego and San Marcos location offers a wide variety of hot tubs, swim spas and patio furniture everything to help you create the backyard of your dreams. In our over 12,000 Sq. Ft Locations you will find over 40 hot tubs on display.